Welcome to the Rhodesian Intaf Site! This website is intended to honour those members of Rhodesia's para military Ministry of Internal Affairs (Intaf) who represented the very spirit of the nation. They were responsible for representing the Rhodesian Government throughout the country in urban and rural areas. Intaf members provided a direct link between the government and the people. 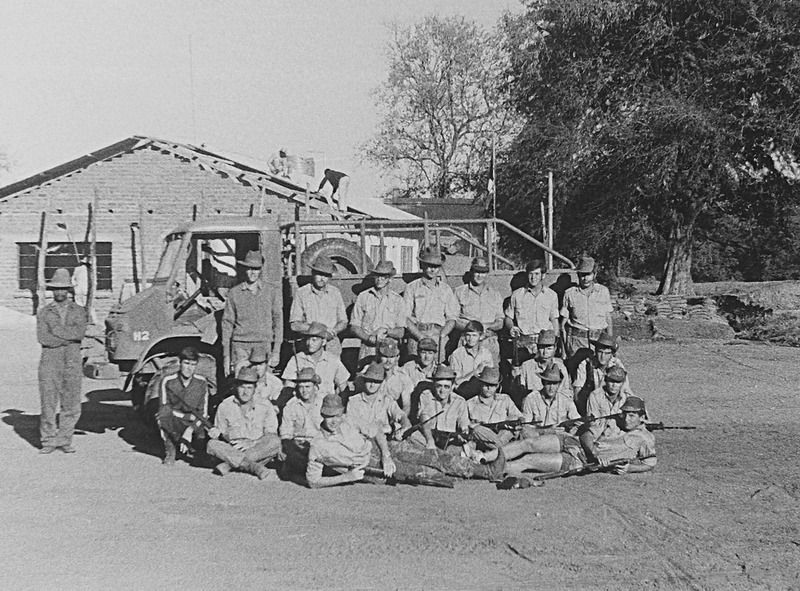 The organisation deployed in very difficult circumstances throughout the bush war and probably lost the most men in action when compared to any other single unit. District Commissioner Lewis Walter has provided a great deal of information for the site and in corresponding with him, he made mention of the following - "There is a line from A.E.Houseman's poem "Epitaph on an Army of Mercenaries" which I have long felt exactly describes our role in the conflict. 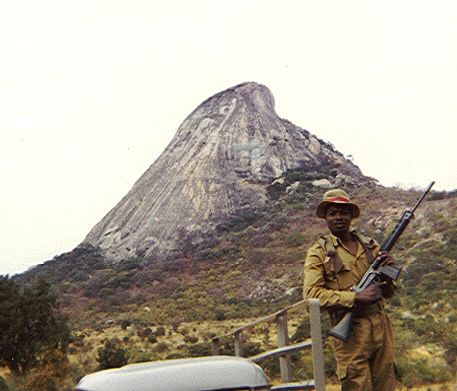 "What God abandoned, these defended........."
The early pioneers of Rhodesia realised in the late 19th century that there was a great necessity for a system of administration for the fledgling country and to begin with formed a very informal organisation that eventually developed into the Ministry of Internal Affairs. A Chief Native Commissioner was appointed in Bulawayo and under his command were a number of Native Commissioners and Assistant Native Commissioners. In 1894 the Matabele Native Police (MNP) was raised and placed under command of the Chief Native Commissioner of Bulawayo. The responsibility of the MNP was to act as the eyes and ears of the administration. The organisation was also responsible for law enforcement, the recruitment of labour, and tax collection. The MNP were not very popular and after the 1896 rebellion several deserted and joined the opposition. The organisation expanded throughout the country and the members of the Department found themselves posted in remote areas where initiative and fortitude was the order of the day. The only government department specifically mentioned in the 1923 constitution was the Native Department. Section 39 (1) states that "There shall be a Native Department" coupled with the fact that the first Premier, Sir Charles Coghlan, was simultaneously appointed Minister of Native Affairs, this indicates the very high degree of importance placed on the Native Department and its administration even at that stage. Thereafter the organisation was generally known as the Native Department. In the 1960's the word Native was exchanged for that of District in the appointment titles. Eventually there were fifty-four districts throughout Rhodesia and each was led by a District Commissioner (DC) with his Assistant District Commissioner (ADC) as second in charge and a staff of white and black members who were responsible for vast rural areas. The department was known as the Native Department during the late 1920s. A further name change took place and by now the government department was known as the Department of Internal Affairs (Intaf). As the bush war developed it was natural that the DC and his staff became very closely involved with the war and duties became para military. The Ministry of Internal Affairs established a paramilitary role in order to look after themselves and became another arm of the Security Forces. Members of the stations underwent military training and took on the responsibility of patrolling, manning the Protected Village system as well as executing an intelligence-gathering role. By 1977 more that eighty members of Intaf had been killed in action. The development in this direction was a natural follow on to the MNP. During both World Wars most members of Intaf volunteered to serve with various military units both in and outside of the country. Those that remained behind continued with their duties in the various districts. 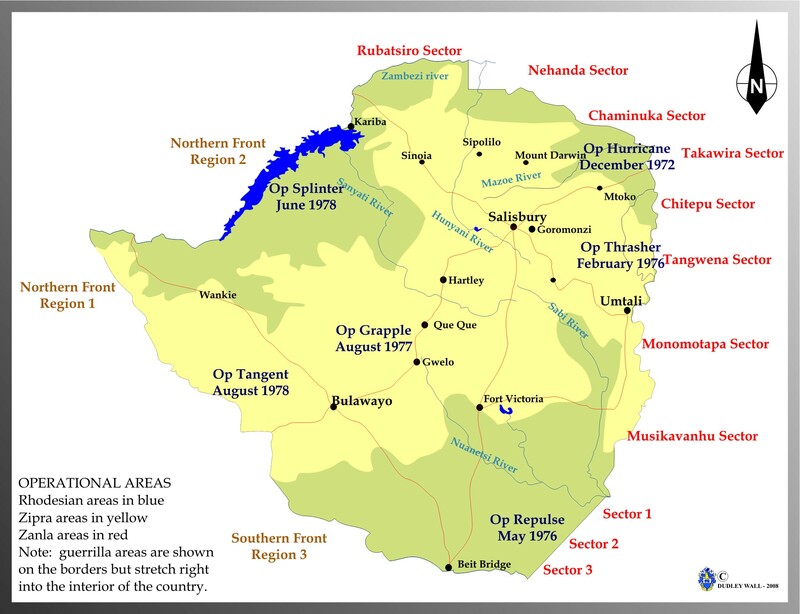 In 1972 when the bush war started in earnest and the districts in the north east of Rhodesia received information of incursions taking place from Mozambique. District Assistants on patrol in the Zambezi valley received information of armed insurgents crossing the Mozambique border and making contact with the local population. They persuaded the people of the valley to feed and house them and arms caches were established and targets were identified for attack. The insurgents attacked some farms in the Mount Darwin district and Army units were deployed. This was the beginning of a protracted guerrilla war. In view of the increase of incidents and the intimidation and killing of local tribesmen who resisted the new "ideas" it became necessary for the Ministry to train and arm its members so that they could go about their daily tasks. In this way the Ministry became a para military organisation capable of looking after themselves and also to contribute towards the war effort. As the war became more intense the role of Intaf became more important and members found themselves responsible for many activities over large areas. District Assistants knew their districts well and provided an effective network of informers. The staffs of the Intaf stations became increasingly valuable as an early warning system and were often called on to provide information on the area, terrain and people as well as acting as guides and interpreters for the various units of the armed forces. The Old Guard. When the bush war first escalated Intaf members were quick to respond in organising themselves to deal with the menace and to carry on with their tesks in the field. The photograph below was taken by DC Alex Bundock in the Mukumbura area of Mount Darwin and was supplied by Nick Baalbergen. These regular members of Intaf wear a mixture of uniforms. One can clearly see that several favoured the traditional slouch hat. Some are wearing camouflaged trousers with khaki shirts and others are dressed in khaki uniforms. Back Row Standing: ? / Denzil Milward / Peter Phillpot "Pothol" /Mervyn - Merv "Lizzard" Langley / Bob Holland /John Penford / Andy Fourie "Furious". Second Row: Charles Hosking "Popeye", Doug Fuller, Louis Clark / ? / ? / Terry Conway / Andre Cronje "Crunchy" / Arthur Page-Wood "Sugar Plumb"
Third Row: Mike Long / Wim van Lindert / Sean Hundermark / Nick Baalbergen / ? / ? / Simon Lucas. Front Row: Warwick "Wog" Corder / Rob Warren. Members of Intaf are a fiercely loyal group of people who served with great pride. They joined the organisation in the spirit of being in the great African outdoors, working with the people of the country in an effort to do good. The war changed the traditional role and Intaf members became soldier administrators. (Ironically, not a new concept as Rhodesian members did this in the 1890s and the Russians did this during World War One!) Today Intaf members are living in various countries throughout the world. They belong to various Rhodesian Security Force organisations and remember the old days and those who paid the supreme sacrifice. 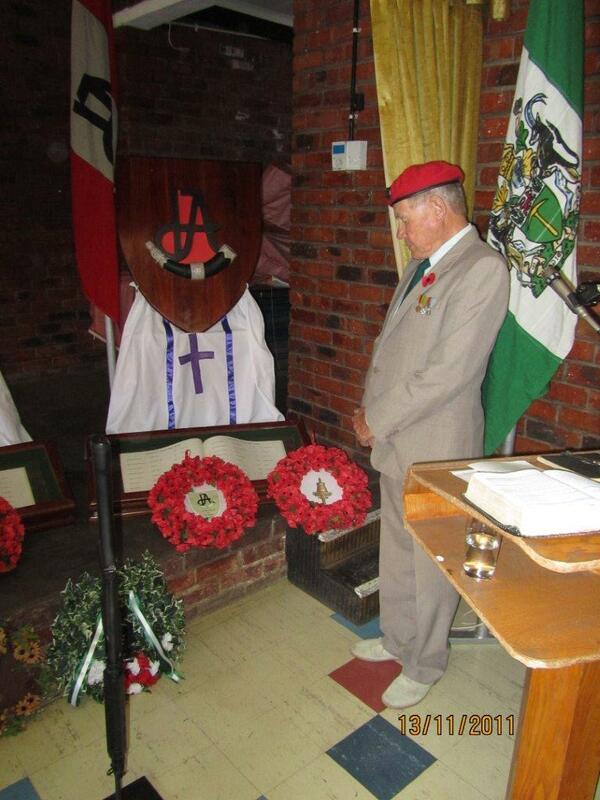 District Commissioner Alex Bundock at the Armistice Day gathering in South Africa in 2011.